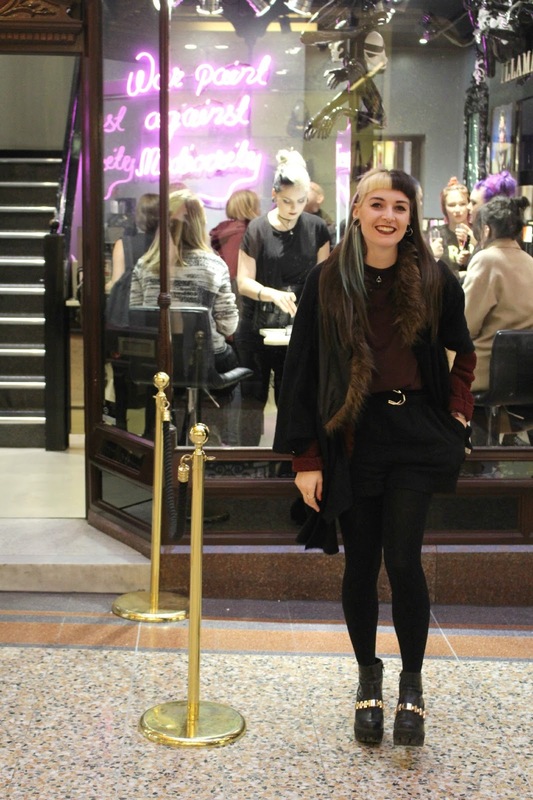 As mentioned in my Previous post last Thursday I checked out the MotelxIllamasqua event that was held in the Illamasqua store in Leeds. I'd peeped on Twitter Motel had been Tweeting about the event that was open to anyone. I am a mega fan of Motel and I thought this would be a great opportunity to break me in for Blogger events [previously wondering if i'd ever get invited to one of them ;)] I of course dragged along James, 10 Boyfriend points to you for never moaning for being taken to blogger related things! 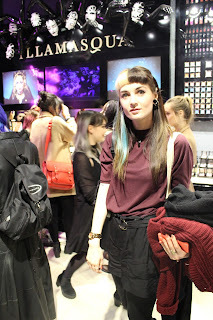 At the store we were greeted with wine and a warm welcome from the Illamasqua staff who all gave me absolute make up envy. 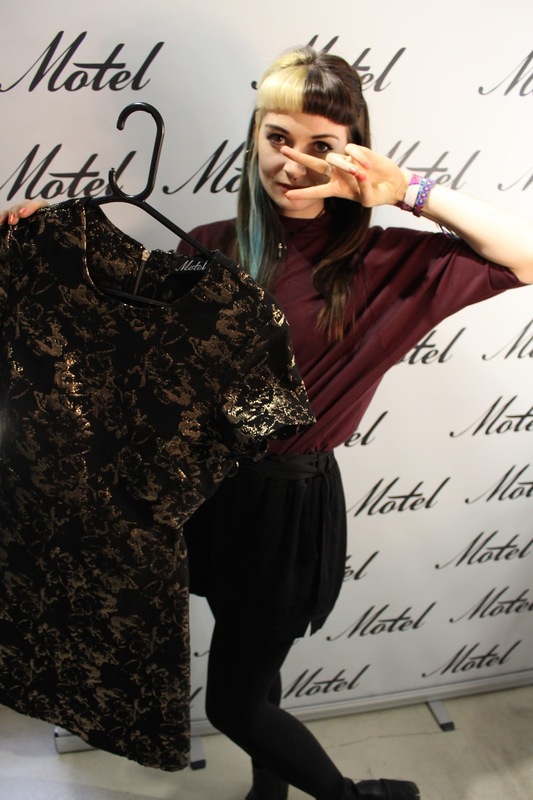 We headed upstairs to go have a look at the clothes and chatted all things Motel. I spent most of my time lustfully looking at the dresses and playsuits wishing I could take home the burgundy velvet playsuit I developed quite a thing for. Perhaps next time. After I had got up close and personal with Motels new range, had a Selfie taken with some of my favourite items in return for the most generous goodie bag and chatted all things blog with the two ladies working for Motel I was asked if I would be interested in applying for #Motelfamily [fingers crossed as that would be the dream! 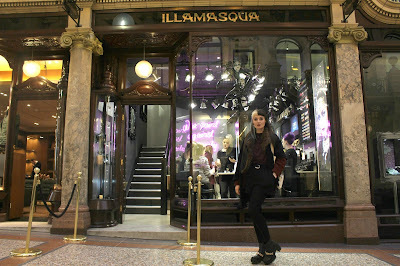 ], I was given a flyer with all the details said my goodbyes and went to check out exactly what ''Illamasqua'' was. As I had never heard of the brand I didn't know what to expect, I'm a standard make up girl. Foundation to hide my blemished skin blusher, eyeliner and a bit of mascara job done. If i'm going out I may partake in wearing lipstick and if i'm even more daring a bit of eyeshadow and some false lashes, not too over the top mind. So milling around the awesomely decked out store [they had weird contorted bodies poking at the wall!? So creepy cool] James asked me what I wanted to try out and look at. I literally had no idea where to even begin looking, then the very lovely Kiri one of the Illamasqua girls asked me the very same question that I was unable to answer Jim. 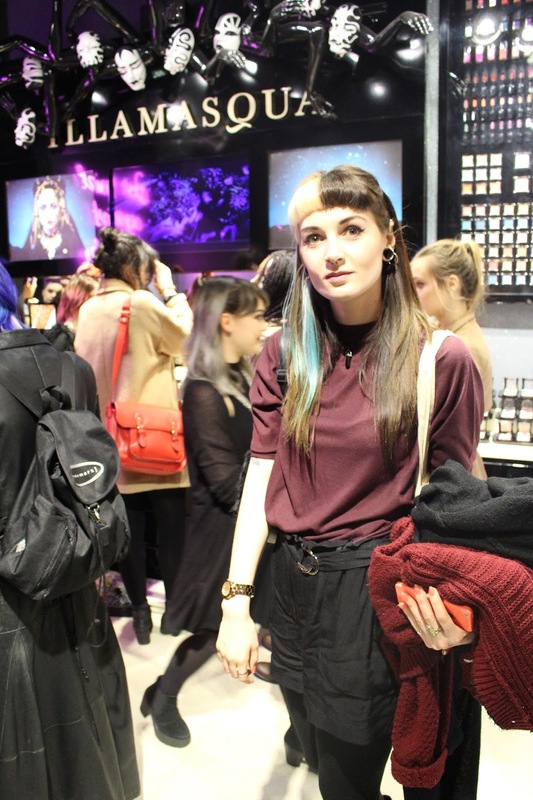 Some of the new eyeshadow palettes with all the glitter caught me eye and this gorgeous deep red lipstick she had on. 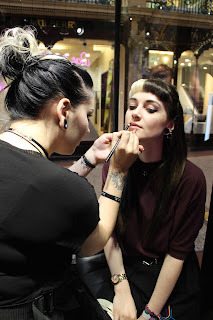 She talked me through the eyeshadow palette that was from their new Equinox range as was the lipstick she had on. Kiri asked if i'd like to try it out with an encouraging nod from Jim I was lead to a make up chair. As soon as Kiri had finished applying the lipstick I was in lovvvvee. Like I instantly felt confident, who knew a lipstick could have such a profound effect. Kiri wrote up the things she had shown me and left her Instagram on the info sheet for me to find as she wanted to read my blog- I was quite flattered ha! Her Instagram is here and I 100% insist you check her out, she is a make up wizard! She also mentioned the store was having a 10% discount that night for the event so obviously the lipstick I loved so much came home with me. After another look around the store, James and I left. I was feeling happy and quite positive about my blog and felt this tiny bit of networking I managed to do might just been pay off. I had also discovered a brand that I think I will be indulging in a little bit more, its knocked Mac right out of the park. It was time to hunt down a maccies promised to my boy and be buy copious amounts of Millies cookie cupcakes in the station to eat in bed while feeling content with the evening. 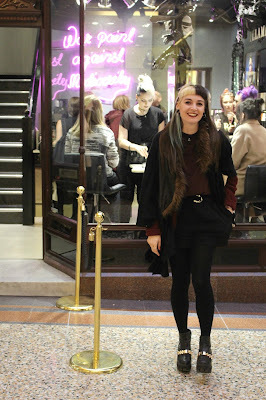 Heres to move events and blogger opportunities, I honestly had so much fun.